For years I’ve walked past rutabagas at the local grocery store and barely noticed them (and definitely never bought one). But, that all changed when I saw a hundred-year-old recipe for Mashed Rutabagas, and decided to give them a try. I was pleasantly surprised. The Mashed Rutabagas had a sweet, earthy, nutty flavor; and they make a perfect winter side dish. Additionally, rutabagas are a good source of Vitamin C.
It took me many years to try rutabagas – but now that I’ve tried them, they’re sure to become one of the winter vegetables that I regularly serve. Place cubed rutabaga in a saucepan and cover with water. Using high heat bring to a boil, then reduce heat, and simmer until the rutabaga is tender (approximately 1/2 hour). Remove from heat and drain. Mash the cooked rutabaga, then stir in salt, pepper, butter, and milk. If desired, also stir in sugar. Serve immediately. Thanks for this. I cook with rutabagas every now and then. This is a very easy rutabaga recipe. I think that you’d like it. I have never tried them. Maybe I should give them a chance. You should give rutabagas a try. I was pleasantly surprised when I tried this recipe. Their flavor is a bit like turnips, but they’re surprisingly mild. I had to look rutabaga up in the dictionary. They the next out to be what we Brits call swede. I’m not wild about them, but a variation on your recipe that we do sometimes enjoy is substituting carrot for half the quantity of swede – sorry – rutabaga. It’s fascinating how this vegetable has a different name in England. I tend to associate rutabagas with Scandinavian cookery, which aligns with the name you use. The mixture of rutabagas and carrots sounds tasty. I’ve just noticed how my tablet mangled my words. It’s so frustrating when I haven’t checked carefully enough before pressing ‘send’. Grrr. Yes, I think rutabagas are associated with chilly northern climates, for sure! I’ve never had rutabagas, but I’ve read Carl Sandburg’s “Rootabaga Stories” , which he called nonsense tales for everyone. Maybe I should cook up some rutabagas, find my copy of the “Rootabaga Stories,” and see how well they combine! Sounds like fun! I’d never heard of Rootabaga Stories until I read your comment. I’m going to have for the book at the library. The link I added has the stories right there — at least, a good number of them. No trip to the library is necessary! Thanks for the clarification. I obviously didn’t look carefully enough at the page that the link went to. I’m off to that page to read one. Mashed rutabagas were always regulars on our Thanksgiving and Christmas table. I just love them, especially with turkey gravy on them. Yum! mmm. . . Mashed Rutabagas would be good smothered with gravy. I hope you decide try doing something with rutabagas. I always enjoy seeing where you take recipes: and with the current focus on serving seasonal vegetables, I think that rutabagas are set for a resurgence in popularity. I will buy it and experiment. My mother used to have these regularly during the winter months. It’s been years since I’ve had mashed rutabaga. We never used sugar when making them. Do try and get smaller ones as the larger ones can be very hard and difficult to pare and cut up. 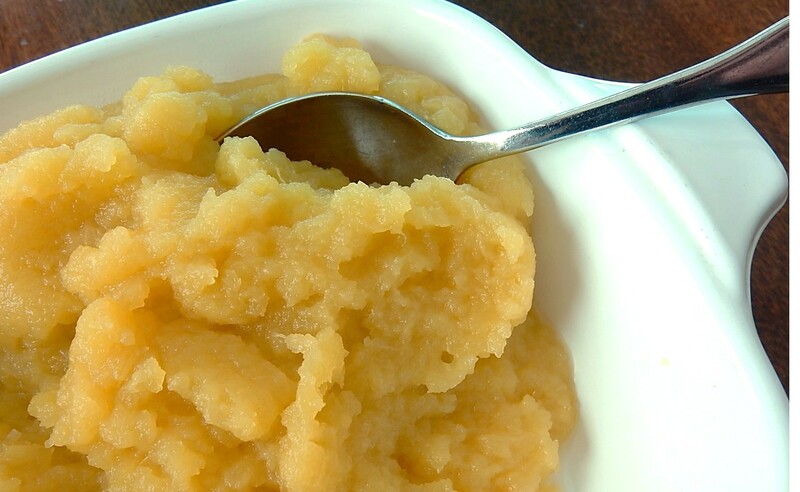 When I made the recipe I didn’t add any additional sugar – and I thought that the rutabagas tasted just fine. I agree- smaller ones would be easier to cut up. My mother had my father use a hand axe one time and a hand saw another. They can sure be difficult, but more than worth the effort. 🙂 Those rutabagas must have really been hard. They were, big and very hard. I’m going to get a small one soon, I can’t find the hand axe. Besides the big ones cook longer. Never used rutabaga, don’t know why… we always used turnips. Be fun to try one dish of turnips ,one rutabaga to see how they compare. That sounds like a fun experiment. My take is that rutabagas are much milder than turnips. I haven’t gotten past the name yet. In New England, at least in New Hampshire, people refer to rutabagas as turnips. That can be very confusing at times. I told friends I would bring turnips and greens for a pot luck and they were expecting rutabagas. Your comment reminds me of something I saw somewhere that discussed “white turnips” and “yellow turnips.” It said that yellow turnips were sometimes called rutabagas. In eastern Canada we tend to call them turnips too, and not many know the term rutabaga. My family often eats them with a turkey dinner: mashed, with a little butter and either brown sugar or maple syrup. mmm. . . I’ll have to try this. I’m guessing that the brown sugar or maple syrup would add a nice hint of caramel to this dish. I really liked them. . . they are definitely worth a try. I mostly just eat them in stew. They are delicious. Growing up in northern Wisconsin, they were a common ingredient in pasties. mmm. . . rutabagas would be wonderful in stews. I agree . . . They have a delightful flavor, and don’t need added sweetness. It’s fascinating how the the name differs so much from place to place – rutabaga, swede, yellow turnip, turnip. . .
It’s fascinating how different families have different holiday food traditions.